Sunrise Sports & Entertainment recently announced a unique partnership between the NHL's Florida Panthers and the storied American rock band, The Eagles. The sport/music entities are teaming up to create a unique, fully integrated marketing partnership that is believed to be the first of its kind in the sports and music entertainment industry. 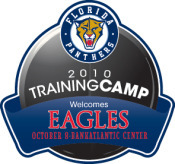 The Eagles' Training Camp sponsorship will provide exposure for The Eagles' concert at the BankAtlantic Center on Friday, October 8th, eight (8) days prior to the Panthers opening night matchup against the Tampa Bay Lightning. Financials of the partnership agreement were not disclosed.